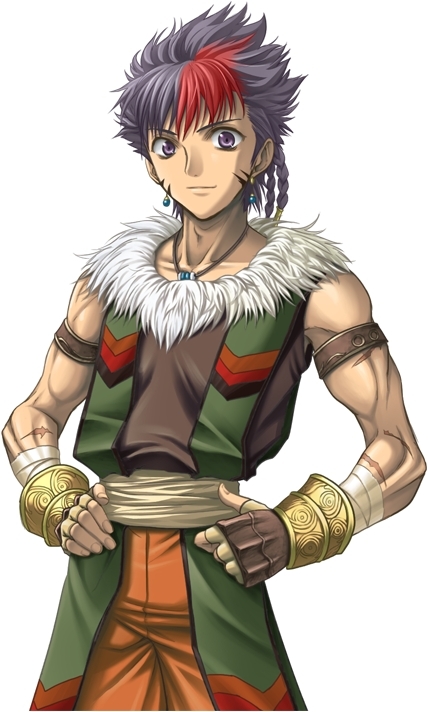 Appearance: Muscular figure with a scars on his chest, short spiky dark gray hair with the exception of one section above his left eye that is bright red, and violet eyes. One look at Zakul and you can tell that he isn't a normal person. Standing at a respectable 5'6" tall this muscular individual is is normally seen wearing the outfit in the picture below, however he has also been seen wearing a pair of blue jeans, with a long-sleeved blue shirt with Gold trim across the bottom. Description: Countless hours, days, weeks and even months of lifting weights, muscle stretching, exercise and pure raw-power training has built the shinobi’s strength to something comparable to an ferocious animal. These ninja are so talented in strength, they can lift objects over their own weight, and strike with the ferocity of one man greater than their peers. This boost is usually enough to cause serious damage to an enemy with a mere punch or kick; causing substantial bruises to their enemy and maybe fracturing bones. Description: A counter attack in which the ninja uses a low spinning kick on the ankles to make its enemy fall while they are running, using their momentum against their opponent. Description: The user charges at their target and spins their body to do a flying round house kick on those opponents within his range of attack. Description: A rising kick that has the enemy’s chin as a target, used to disarm or rising him up for an air combo. The user will lower their body before performing the kick, allowing them to launch the enemy more efficiently. Description: A technique often used after shoufuu, the user will move at high speeds below an opponent as they're in the air, as if becoming their shadow. Because the move is used so quickly after the enemy is launched into the air, it gives them no time to counter, allowing the user to proceed to strike with ease. Description: Following up after Konoha Kage Buyou to manuever their opponent in a vulnerable aerial position. While shadowing their opponent, the user will attempt to strike them from a vulnerable angle. If they are unable to make a clean strike, they will strike anyway as a feint, to draw their target's attention and defense to one area. The user can then strike the undefended area and begin knocking them downwards towards the ground. As the enemy falls back to the earth, The user will deftly rotate his body around to deliver a full force kick to their targets chest. Description: Unbeknownst to Zakul whenever he throws a punch, his body instinctively floods the punching arm and hand with Chakra, increasing the striking force of the punch by (25% | 50% | 75% | 100% ) the amount of chakra that his body puts into increasing the strike will vary based on how hard of a punch he is intending to throw.